St. Michael's Church, Clare leadlight windows | Jenkinson Antiques - an ever changing cabinet of curiosities! On January 30th 1883, the Northern Argus reported that the structure was completed. The windows were provided by the members of the church and “of stained glass and quite in harmony with the structure”. St Michael’s was considered to be “magnificent …. and one of the best outside Adelaide”. 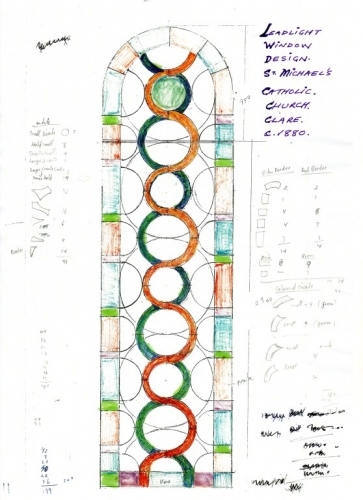 The windows were of an unusual design, featuring a series of ascending linked circles of frosted glass with a further series of smaller glass rings moving up within these in alternating colours of deep ruby red and Bristol blue flashed glass that was so arranged as to suggest a helix or spiral. The edges of the windows are of the same red and blue, in panels, alternating with a mid green and a warm orange/yellow. A sacred purple exists as two panels of glass at the base of each window. The windows are metal framed, using what then, in 1880, must have seemed the most extravagant of modern materials. 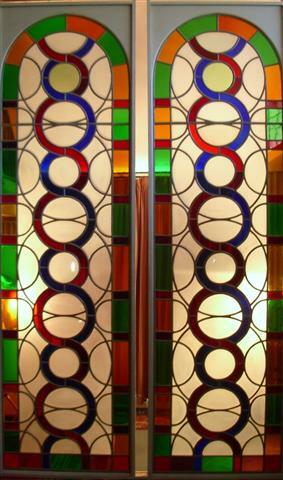 They are made from an extruded cast alloy of zinc and tin that has been fashioned to provide fine sculptural glazing bars that accurately describe and contain the elaborate circles and arcs of coloured glass. The framework has a lightness and balance that could only be achieved with the strength and lightness of a metal alloy. Each point of intersection of the glazing bars is lead soldered and the glass puttied in. The windows are quite large, each one being about 4 metres high by 1.1 metres wide. They are currently installed in oak frames made from 85mm x 30mm solid timber. The SA Register of 30 January 1883 described the windows thus – “the windows are stained glass and are very gay and costly”. In a discussion with Father Brian Pippin of the Sevenhill Parish (7/7/11) he mentioned that there were no known records relating to the origin of the windows. Metal windows like these were available from the Wunderlich firm in Sydney during the late 19th Century. Records available on-line from the Powerhouse Museum indicate that this firm made some metal windows and they also imported some from Germany. Father Brian said that there are Wunderlich pressed metal ceilings in parts of the church. He also said that German Catholics were involved with the beginnings of the Clare Church, and in particular, Austrian Jesuits. It seems possible that the German connection might have translated into a business arrangement as well. The leadlight firm of H L Vosz in Adelaide had as its principal a German who perhaps acted as agent. In any event, the window’s origins remain a mystery at this stage. After 100 years of weathering in Clare, the metal window frames had reached a point where replacement seemed better than maintenance and the Parish decided to commission new windows. The Church retained the original windows behind the altar. They show the same basic arrangement as those that originally graced the north and south walls, with the ascending white glass circles in the centre of the design and the same rich symbolic colours around the edges. These colours symbolise important themes in the Catholic Church, red has been described as the colour of blood and sacrifice, blue the colour of heaven, amber refers to God’s glory, white symbolises purity and joy and green is a symbol for hope and growth. Purple, in olden times a rare and precious dye, refers to royalty and kingship. Stained glass windows have been intrinsically connected with sacred architecture for over a thousand years. They have been an aid to devotion and evoke a sense of the spiritual realm. Somewhere along the way stained glass has found its way into secular architecture, and South Australia has many wonderful examples in public and private buildings. The lead lighter chosen to replace the windows enlisted the help of Geoff New, an art teacher from Gawler, to remove the old windows with him. Geoff took his share of the salvage home and propped these six windows up in a paddock on his small acreage, sometime in the early 1980s. They were for him part inspiration and part project in waiting, and they were still there 30 years later when he died. They were in ruinous condition, with one frame having a peppercorn tree growing through it, and much of the original glass lay scattered around the rotting frames. We retrieved these windows and all the intact glass panels and took them to our workshop at Parkside. The first stage of restoration was the removal of glass remaining in the now geriatrically fragile metal frames. Only two windows were considered salvageable but all the glass was needed to ensure losses could be covered. Once stripped out, the metal frames were re-soldered and re-finished with a protective structural grey paint. They were then fixed into solid oak frames to keep them rigid for glazing. We then commissioned an expert lead lighter, Fozi Leadlight, to re-glaze the windows. He puttied the old glass into the restored frames based on the glazing design he recorded from the original patterns. The windows are now fully restored to their former glory and await an appreciative new owner. The frames are sound and all the glass is good. They would bring a sense of awe and wonder to any building that could accommodate them, for example a grand home, a cellar door or a barn conversion. For those needing a front door set to go with these historic windows, we also have a fine set of glazed Georgian doors from the Grosvenor Hotel, North terrace Adelaide in a comparable style. Download a brochure with more details here.